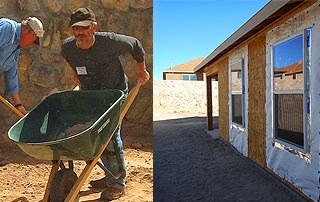 "We are participating on the last build of the season in Las Cruces. I can see why. Already, the wind is picking up and the air is so thick with dust that we can't even see the beautiful mountains that surround the city. Our crew of 15 workers and 2 leaders are busily putting the final touches on 4 houses, including trim, cabinets, and blinds, along with grading and landscaping the yards. The houses are all in a row, so we "commute" from one to the next. The modest 1,100 sq.ft. 3 bedroom, 2 bath homes have mostly been built by volunteer labor. The work is not too demanding, yet we are still sore at the end of the day, and are glad the municipal pool (complete with showers) is only a couple of blocks away!"